Chose a blind to control the light from your skylight! The new innovative Pick&Click! ™ brackets make blind installation a snap! 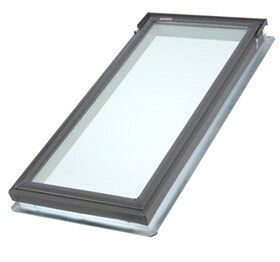 Every FS (VSE, VS) skylight comes pre-installed with Pick&Click! ™ brackets that allows for fast and easy installation of sunscreening blinds and accessories. The FS skylight comes with a select pre-finished white wood frame and protective aluminum or copper cladding. Integrated gaskets drain condensation to the outside. The smooth, low-profile of the FS skylight does not obstruct your roofline. Venetian Blinds - Accurate glare and light control. Available in electric and manual versions. Roller Blinds - Diffuse the light. Available in solar, electric and manual versions. Our new trim kit provides a clean interior finish when replacing older "drop-in" or "flush-mount" skylights. The video on this page explores the installation process for VELUX fixed (non-venting) deck mounted skylights. If you are interested in a specific installation step, you can select from the scenes listed.